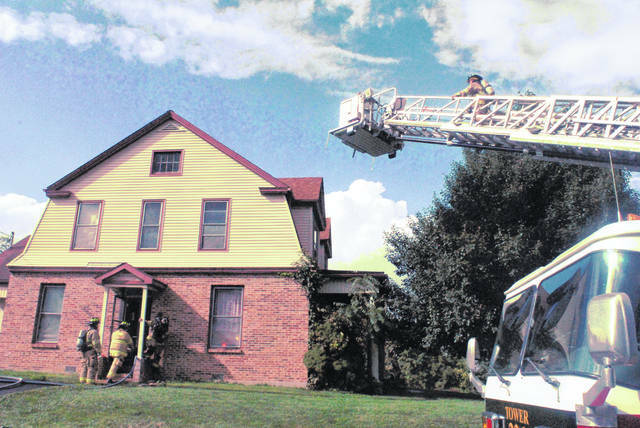 A ladder truck was called Monday afternoon to the scene of a possible grease fire at a residence on Uhrig Street, but firefighters were able to contain the flames and all the occupants escaped unharmed. Paint Creek Joint EMS/Fire District Chief Dave Manning told The Times-Gazette at the scene that firefighters were able to get the fire under control before too much damage was done. The chief said the blaze was reported as a grease fire, and the smoke smelled similar to smoke produced by grease fires. Manning said there were no reported injuries, although one man was treated at the scene for smoke inhalation. Manning said all the occupants of the home, including an infant, escaped unharmed.